Learn how to develop modern backend APIs with Hapi.js, Node.js, and Redis. TL;DR: In this article, you are going to learn how to develop modern APIs with Hapi.js and Node.js, while using Redis as the persistence layer. As it is not possible to release an API without a security layer, you will also learn how to secure your application with Auth0. If needed, you can find the final code developed throughout this article in this GitHub repository. "Learn how to build modern APIs with ease by leveraging tools like @hapijs, #redis, and @nodejs." Hapi.js is a framework for creating backend APIs. What is nice about Hapi.js, when compared to other solutions like Express, is the coding-by-configuration architecture. As you will see, most of the "coding" is actually done by tweaking the vast configuration interface that Hapi.js provides to developers. This approach helps to split the common aspects of HTTP from the handler. "What is cool about @hapijs is that it provides a coding-by-configuration approach that facilitates the development process." What Is Redis and What Will You Build? Redis is an open-source, in-memory data store that provides an interface so applications can manipulate data based on a key-value approach. As everything in a Redis database is simply a value accessible through a key, fetching data from it is extremely fast. This characteristic of Redis makes this database perfect for applications like to-do lists. So, in this article, you will use Redis to act as the persistence layer of a backend API that supports a to-do list application. You won't develop the frontend application in this article, but you will soon, on an upcoming one. Note: In this article, you are going to use Hapi.js 17. This version has breaking changes from version 16. What Is Docker and Why Do You Care? To keep your machine clean, you are not going to install Redis directly on your operating system. Instead, you are going to run Redis inside a Docker container. Docker, if you don't know, is a solution that enables users to run programs that operate completely isolated from each other. Docker achieves this by containerizing these programs into engines that work similarly to virtual machines. However, containers are way less expensive (i.e., more lightweight) when compared to traditional virtual machines. For example, you can easily bootstrap a container that uses NGINX in front of a Node.js instance to serve a web app with 16MB or less. Also, Docker uses a file called dockerfile that facilitates the process of sharing containers configuration with others. In this article, you are going to download and use a pre-built Redis container that allows you to use Redis fresh out of the box, with no setup. src/: A directory that will hold code related to the server setup. src/routes: A directory where you will define the endpoints of your API. boom: This is a library that tightly integrates with Hapi.js to throw HTTP-friendly error objects. good: This is a library that you will plug into Hapi.js to monitor and report on a variety of server events. good-console: This library is useful for turning good server events into formatted strings. good-squeeze: This library is useful for filtering events based on the good event options. hapi: This is the main package of Hapi.js itself. hapi-auth-jwt2: This is an authentication scheme/plugin for Hapi.js apps using JSON Web Tokens. hapi-require-https: This is a library that will help you force secure connections (i.e., HTTPS). inert: This is a library that helps you serve static file and directory handlers in your Hapi.js API. jwks-rsa: This library retrieves RSA public keys from a JWKS (JSON Web Key Set) endpoint. lout: This library helps you create the API documentation for your Hapi.js backend. node-env-file: This library parses and loads environment files into a Node.js environment (i.e., into the process.env object). redis: This is a Redis client for Node.js applications. vision: This library enables templates rendering for Hapi.js. Note: You might also want to start Git (or any other version control system) now and start committing your work. It's always a good idea to use tools like Git to manage your source code. If this is the first time you are running Redis locally with the help of Docker, this command will output Unable to find image 'redis:latest' locally in your terminal and will start downloading a Redis image from Docker Hub. For this article, you don't need to learn how Docker works. Issuing the command above suffices for you to move along. However, after you finish with this article, make sure you learn more about Docker. The tool is amazing. To start with a secure backend from scratch, you will sign up for a free Auth0 account now (i.e., if you don't have one yet) and you will configure your project to use this identity provider. If you don't know, Auth0 is a global leader in Identity-as-a-Service (IDaaS) that provides thousands of enterprise customers with modern identity solutions. Alongside with the classic username and password authentication process, Auth0 allows you to add features like Social Login, Multi-factor Authentication, Passwordless Login, and much more with just a few clicks. So, after you sign up for Auth0, you can head to the APIs section of your dashboard and click on Create API. Then, on the dialog that Auth0 shows, you will have to provide a Name for your API (e.g., "Hapi.js Tutorial") and an Identifier (e.g., http://localhost:3000). The name of your API is just a label so you can easily remember what the API is about. The identifier is a string that you will use while configuring your backend. This identifier doesn't really have to be an URL, as Auth0 won't call it in any moment, but it's advised to use one. After filling out the form, click on Create so Auth0 finishes the creation for you. Replace <YOUR_AUTH0_DOMAIN> with the domain you chose while creating your Auth0 account (e.g., blog-samples.auth0.com). The other configuration variables will work in your local environment, unless you chose another identifier for your API. If that is the case, you will have to set the correct value to the AUTH0_AUDIENCE variable. Note: The SSL variable above defines if your API will accept only requests through a secure channel (i.e., HTTPS) or not. This variable will be used by the hapi-require-https library that you installed before. Perhaps you didn't realize (or perhaps you did), but the createServer function used in the script above doesn't exist yet. This function, as stated on line #4, is expected to be defined on a module called server in the src directory. The main export from this code is a function that creates and returns a valid Hapi.js server. This function starts by accepting arguments from the index.js file and by creating the server. Then, it provide some default configurations like port and host to make sure that everything goes fine if the caller doesn't specify these variables, but soon it replaces them with the ones provided by the caller (if any). After creating the Hapi.js server (Hapi.server()), this script decides, based on the configuration passed, if it is going to use SSL or not. Then, the script configures the plugins you installed before (e.g., vision, inert, and lout) in your Hapi.js server. Finally, the script secures the server by using the jwt strategy (server.auth.strategy('jwt', ...)) and by making it the default authentication method (server.auth.default('jwt')). The function validateFunc (defined at the top of the script) is given users' credentials and returns an object telling Hapi.js whether these users have access to the current resource or not. In this simple example, you allow all users access if they have a valid token, but you can be more restrictive by refactoring this function. The last thing this script does, besides returning an instance of the Hapi.js file, is to define that it will load the endpoint (also known as routes) from a module called routes. You will define this module in the next section. Now, it is time to learn how to define endpoints (i.e., routes) in your Hapi.js server. In the server module, you called the server.route function, which accepts an array of routes for your server. As such, you could simply define these routes directly into the server module. However, to make the code more readable and organized, you will put each route in a different file. This code maps over each filename and returns an array of imported routes. As you can imagine, you still have to define these files and routes. The export from this file is a JSON object that represents a route for Hapi.js. The method and path properties tell Hapi.js what HTTP method and what route is required to call the handler code. In the options, you specify jwt as the authentication required to access this route. The description, notes, and tags document the route for others using it. The validate object is an extremely useful courtesy of the joi library. This allows you to specify what inputs are required for the route and, if not met, Hapi.js will automatically throw an error for you. All that is required for this route is an item that comes as the payload of requests. This item must be a string and is required (string().required()). Finally, the handler runs your route and returns a value to Hapi.js. You use the JWT subject as the key for the Redis key-value pair, and the value of this key is the string sent by the user. You use the new promisified Redis functions to add the item to Redis, and you return the number of items in the array (with a 201 response code). If anything goes wrong, your Hapi.js server will send an HTTP error code back using the Boom library. The route is very similar to the POST route. You define the endpoint as an HTTP DELETE route with a required index parameter to delete a value from Redis. To delete the item from Redis by index, you first overwrite the value of that entry, and then delete entries with that new value. What is Hypertext Application Language (HAL)? When you define your final route for retrieving the todo items, you will borrow some features from the HAL specification. This spec is designed to make it easy to traverse APIs without having to guess endpoints. For your case, you will page the results when retrieving items, so you will include a link to the next page of results in the response. This way, the client applications that use your API won't have to generate the links themselves. This module (or file) defines a GET HTTP route with two optional query string parameters (with default values set). By using these parameters, your client can specify the first element (start index) and the number of results they need. Note that this script gets the results from Redis and also the total number of results. This information is important so the client can display how many items the user has. In the response, you add a nextlink property with the API URL to call for the next set of results. "item": "It should not work." That is, your server is telling you that it is expecting you to be authenticated somehow. The server doesn't specify that it's expecting an access token from Auth0 because you shouldn't be adding details like that about your services. However, you know that this is what you need. So, there are multiple ways to fetch a token from Auth0. The strategy that you will use will depend on what context you are in. For example, if you are on a Single Page Application (SPA), you will use what is called the Implicit Grant. If you are on a native, mobile application, you will use the Authorization Code Grant Flow with PKCE. However, for a simple test like this one, you can use your Auth0 dashboard to get one. So, head back to the APIs section in your Auth0 dashboard, click on the API you created before, and then click on the Test section of this API. There, you will find a button called Copy Token. Click on this button to copy an access token to your clipboard. "item": "Learn about more about Docker, Auth0, and Redis." Note: You will have to replace <YOUR_ACCESS_TOKEN> with the token copied from Auth0. In this case, you are issuing a DELETE request with index equals 0 so your API remove the first element from your to-do list. Cool, you just used your API for the first time! 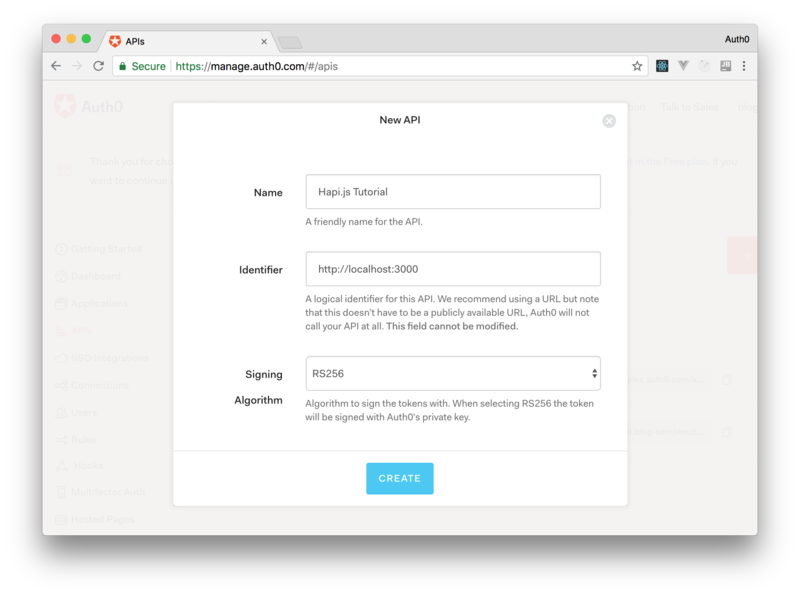 "In less than an hour, I managed to create a secure and modern API with @hapijs, #redis, and @nodejs." 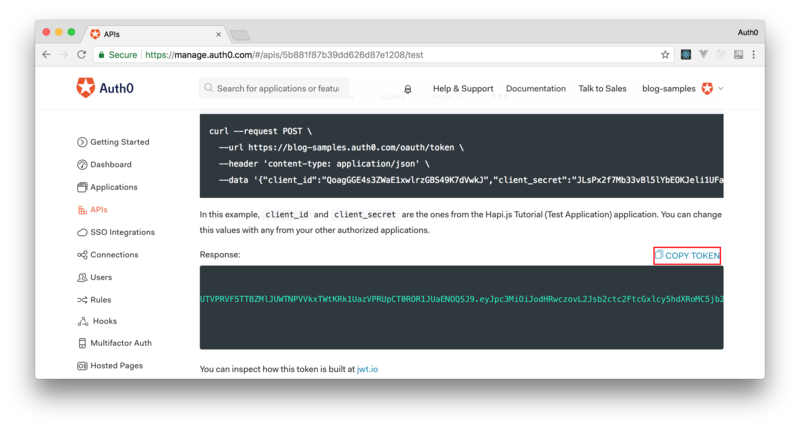 In this article, you learned how to create modern APIs with Hapi.js, Node.js, and Redis. Also, you learned how to integrate your API with Auth0 to take advantage of the state-of-the-art security provided by this company. All of that, without struggling too much. However, you wouldn't expect end-users to use a REST API directly through the command-line interface or through generic HTTP clients like Postman, would you? As such, in the next article, you will learn how to create a Single Page Application to interact with your API. To create this application, you will use a modern approach based on web components and LitElement. Stay tuned!